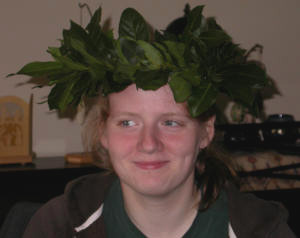 A crown of laurel leaves for high achievement is a tradition dating back to the ancient Greeks. Our niece, Emily, recently graduated from high school. Because she was her class valedictorian and all-around wonderful person we made her a wreath of fresh bay. The freshly picked leafy stems are woven into a circle and tied with green floral tape. The soft young leaves were snipped off leaving only the sturdier year old growth. A wreath like this easily dries and can be saved as a memento or hung in the kitchen for cooking. A few years ago we were in Padua during university graduation festivities. All the Baccalaureates were wearing wreaths on their heads or around their necks. California Bay “Umbellularia californica” is a different plant entirely, and while the leaves have a similar texture the flavor properties are quite different. The flavor and fragrance of California bay is quite pungent and harsh and I never cook with it. Both plants are growing at my home and I occasionally pick a leaf of each, crush and smell in wonderment as to why some food writers continue to instruct “use one Turkish Bay leaf or 1/2 California Bay leaf”. Julia Child, a native of California, was disdainful of California Bay for cooking and in my talks I often say if it wasn’t good enough for Julia it’s not good enough for us. True Bay, is native to the Mediterranean basin. Italian restaurants often use containerized Bay plants to create outdoor walls and extend seating. Bay, when grown in the ground is hardy to Zone 7. Plants grow in full sun to half shade. Give them a light fertilizing and regular watering the first season and once they are established they can pretty much fend for themselves. 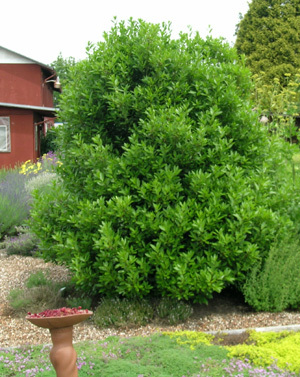 Evergreen trees may eventually reach 15′ in height. I recommend regular pruning. The tree in this photo is at our nursery. It grew too large for the assigned space and every three years we cut it to the ground and it happily sprouts from the stump to produce a nice oval bush in a few months. Our nursery and others offer bay plants for sale. Grow as a single tree, a shrub or planted as a hedge. Because it is such a useful herb and tolerates some shade it is one to add to the garden.